In the aftermath of the most connected, global, educated, and cashed up art market in history, many contemporary artists are finding themselves at odds with their own success, making art for a market which no longer exists, and turning this into a new practice. In this familiar but certainly different art market that we currently reside in, the artist must juggle the pluralism which was prevalent in the "super market", and ground it with a consistent, clear, and equitable practice to gain a large mainstream success instead of pandering to a subset. Of course, that is if an artist is serious about working within the market. Other artists, like YaYa Chou, have found another way. YaYa Chou, born and raised in Taiwan, was originally inspired by experimental animation and filmmaking, including clay animation and set design. This slowly turned into a self-taught informal training in mixed-media sculpture and installation. Still working within some of the conceptual framework of the auteur, Chou finds incredibly original ways of representing not only representational objects, but also many of the complex abstractions of human relationships. In Chou's own artist statement, she states this best with, " It is my wish to broaden the definition and experience of fine art and its creators." Through Chou's material curiosity, and the near Outsider feel to some of the ways in which she works, the final results are something between a cartoon character and something you would find in a biology classroom or text book. However, in direct contrast to some of Chou's Outsider behavior and self-taught/cross-over status, her work is highly intellectual and designed specifically to impact the viewers in her various audiences. Conceptually, Chou's work deals with human social behavior and the many connections between the individuals in different civilizations, especially the re-occuring theme of a distance or dichotomy between man and nature. Through all of this, Chou attempts to work through relationships and experiences of art pieces instead of the direct definitions and concepts themselves. In "Soft Tissue: Sculpture and Works on Paper", currently at the Fort Wayne Museum of Art, Chou explores the similarities and differences between Eastern and Western medical practices, and compares them to political systems in each society as well. In this way, the clinical and somewhat cold diagrams of organs and dissected animals are paired with the "voices", emotions, and in general, humorous definitions attributed to each part. Through this way of 'cartooning", Chou's watercolor and ink drawings must be read as much as they must be seen, reminiscent of other contemporary drafters like Raymond Pettibon or R. Crumb. In YaYa Chou's works on paper, like "Tongue" and "Crab", seemingly benign organs and cellular structures become scenes of social unrest and critique. For instance, in "Tongue", one of the notes reads" Civilian Follicles: more elevations caused by underlying class segregation, each has a crypt in its center," thus mixing biological dissemination of knowledge with populist-radical social politics. 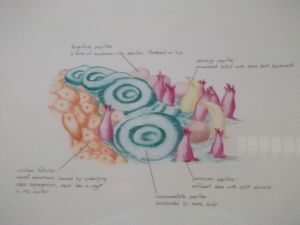 Many other drawings — such as "Choroid Coat of Eyeball" (2010), a gorgeous large dissection of an eye, and various drawings of diatoms, placenta, sea urchins, and nephrons (the basic unit of our Kidneys) — feature similar notes. Some of these are witty and biting, while others seem cold and technical, but still offer coy comments about functionality; the note on “Eyeball,” for instance, reads "Schlera: to initiate non-verbal communication". In many of these notes, the words are in contrast to the nature of the image, investigating just how natural these organic structures are, and ending by exposing the true nature of many social aspects of humanity which are, despite civilizations efforts, sometimes more basic and less emotional than the many bio-mechanical aspects of our own organs. Chou's other body of work presented as part of "Soft Tissue" is a large collection of assemblages placed into glass vessels (38 individual pieces all together) and strung up, hanging from the ceiling as a total installation. Starting in 2007, Chou expanded her mixed media work into these sorts of pieces through collaborations with glass artists. Each vessel is different than the others, but some, like "I was Happy", and "Widow" can be grouped together through their inclusion of insects placed inside the glass vessels, or "Octopus I & II", both of which contain silicone castings of octopi as well electronic elements which add in a chaotic communication through sound. Because of the nature of these assembled, but meticulously created objects, Chou's three dimensional work, informed by her works on paper, begin to display a very interesting connection to Lee Bontecou, the somewhat estranged sculptural genius whose obsessive construction of aquatic animals from unique materials has placed her in some of the highest realms of the art world. This connection between material and the process which creates the final piece of art comes across in a very different way than Bontecou however. Where Bontecou was somewhat brooding, eschewing connections to art historical references and acting somewhat "Emo" for an artist most prevalent in the 1970 and then again in the early 2000's, Chou seems to embrace the comic nature, ambivalence, and appropriated sense of her work allowing it to stand on its own two feet, even without a direct market to tie it to. Fort Wayne and its newly renovated Museum has been honored by exhibiting the work of such a fine artist as YaYa Chou. Because of the quality of Chou's work (and resume: she has had exhibitions in international film festivals, and at the Museum of Modern Art) and the nature of the messages encapsulated in them, we are not only spreading a sense of acceptance of contemporary ideas to other great artists around the nation, but hopefully also beginning to assimilate these ideas into our own culture. "Soft Tissue" is a perfect example of how contemporary are can, and does have the ability to completely transform the materials and environment around it for the better. "Soft Tissue: Sculpture and Works of Paper by YaYa Chou" is currently open and will be exhibited throughout the summer at the Fort Wayne Museum of Art, until August 22.